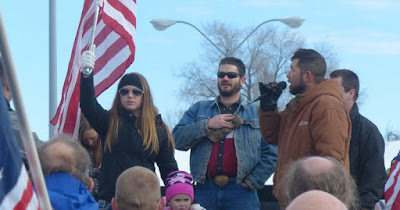 The Oregonian reports the Bundy family has joined “hard-core militiamen” in the occupation of the headquarters of the Malheur National Wildlife Refuge 50 miles southeast of Burns, Oregon. “The facility has been the tool to do all the tyranny that has been placed upon the Hammonds,” Ammon Bundy said. According to the Oregonian, Bundy has called patriots from across the country to join them at the remote refuge. The occupation is in response to prosecution of two Harney County ranchers, Dwight Hammond Jr. and Steven Hammond, who were convicted of arson under a provision of a wide-ranging federal anti-terrorism law, according to the newspaper. The feds decided to prosecute the Hammonds, who own about 12,000 acres in the Diamond-Frenchglen area of Oregon, after they used fire as a tool to combat invasive plant species on their ranch. The government accused the ranchers of allowing the fire to spread to federally owned land. The Hammonds were indicted in 2010 on federal arson charges and faced sentencing as terrorists under the federal Antiterrorism and Effective Death Penalty Act of 1996. The occupation appears headed for a confrontation with the Harney County Sheriff’s Office and the FBI. Alex Jones posted a video giving background information to the brewing crisis at this link in an article titled:Alex Jones: New Waco Equals Civil War. Are the feds attempting to provoke a new Waco-style standoff in southern Oregon? Alex asks if the feds are trying to provoke a new Waco-style standoff in southern Oregon, and gives a word of caution to the armed groups assembled there, questioning the timing of the provocation, new gun laws set to go into effect and other factors. As you may remember the Bundy's run-in with the federal government ended in a peaceful resolution when the feds were forced to surrender to American citizens during peaceful protest on the Bundy ranch. The Bundy family is in Oregon along with several militia groups launching an offensive in support of a ranching family whose patriarchs have been convicted of arson for burning ranch lands. The Bundy’s are no strangers to armed federal confrontations. In an epic standoff last year that Infowars reporter David Knight described as being like “something out of a movie,” supporters of Nevada cattle rancher Cliven Bundy advanced on a position held by BLM agents despite threats that they would be shot at, eventually forcing BLM feds to release 100 cattle that had been stolen from Bundy as part of a land grab dispute that threatened to escalate into a Waco-style confrontation. And now we learn that the feds have employed drones (in their words "High altitude surveillance platforms”) to monitor the situation at the Malheur National Wildlife Refuge in Oregon, scene of the Hammond stand-off with various U.S.federal government agencies. While performing my own due diligence regarding the situation in Oregon (Read About It Here), I made contact with a few of my most trusted government sources. In an incredible stroke of luck, one such source, who shall remain nameless, is directly involved in monitoring the ongoing situation at Malheur National Wildlife Refuge. According to my source, as so-called militia members from across the country made their way to Oregon, various assets, which were not directly identified, were readied. These assets have already been deployed to the region. Although the source would not describe the particular drones being employed, he did indicate that “High altitude surveillance platforms” are currently monitoring activity at the Wildlife Refuge Office, which is currently under occupation by the armed militiamen. "These particular assets are high altitude so they are invisible to the naked eye," the source said. "Even at night, maybe you’ll catch a glint of light or something if it catches the moon while it turns but, for the most part, they’ll never know they are up there," he assured me. As our conversation went deeper into probabilities and possibilities, the source made no effort to disguise his anxiety over a potential escalation on the ground. When I asked what kind of response the militia could expect if they turned their guns toward government agents, the source chuckled a little, then grew more serious. "Dude, these yahoos wouldn’t know what hit them. We already have snipers deployed to the area but,..” There was a lengthy pause. I urged him to continue. "Well, that location is very remote. There is really no risk to non-combatants if this thing goes hot. A couple of missiles and the whole thing will be over." "Are you saying they would commit to a drone strike on the building?" I asked. "I don’t know if they would or not. But, I do know that we could," he said. "The equipment is already staged in Washington. Authorization is just a phone call away, bro. If this thing goes live, I have no problem shooting a [expletive-deleted] Hellfire up their asses." There is no doubt that the federal government through the controlled MSM will label the the Hammond's and the Bundy's as terrorists. This is the real reason that the Patriot Act was passed. The pretense was fighting foreign Jihadi's but the U.S. federal government has been training for the confrontation with American citizens; specifically patriots, gun owners, and veterans for decades. Witness the Jade Helm 15 military exercises in the U.S. identifying certain states as "hostile" and "resistant pockets" where special forces of various U.S. military branches worked in conjunction with local law enforcement to infiltrate various communities undetected as well as practicing subjugation of American citizens. I hope and pray that the feds will reason this situation out and provide an adequate remedy for redress of grievances to the Hammonds but as the last article quoted here indicates, the U.S. federal government agencies are prepared to go all the way as they did at WACO if need be and kill all involved occupying the Malheur National Wildlife Refuge facility.